An attractive and colourful low-creeping herb that’s sure to draw one’s attention, especially mine! I do admit to being a sucker for just about any plant with variegated leaves! We were somewhat mesmerized when we first sighted those lovely ground-cover plants, less than two years ago at Felda Residence Hot Springs in Sungkai, Perak. I was amazed at the foliar variegation. A myriad of colourful hues greeted us, where each leaf is artfully designed and appeared different from one another in tones. 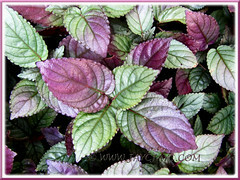 Mostly metallic grayish-green and randomly stained with purple or reddish-purple on the upper leaf surfaces, and coloured wine-red underneath. Simply marvelous! My attraction to it lingers on, so much so that when I spotted some look-alike plants growing on a grass-covered hill slope recently, I brought some home. Sadly, the lovely colours that were expected didn’t manifest at all? 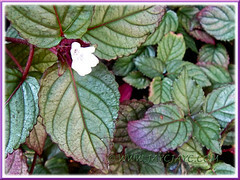 While researching for this article, I found out that the plant’s ID is Hemigraphis reptans, somewhat related as they’re species of the same genus, but alas, it’s a weed, instead. Aaargh!! Anyway, we’ll let them grace our garden for the time-being. Red Flame Ivy or H. alternata, is a versatile tropical perennial that prostrates and spreads with rooting stems when grown on ground, and on hanging baskets it cascades over beautifully. It will be a striking addition to garden beds, borders and containers for that gorgeous splash of colour! Origin: Native to Indonesia (Java) and India but naturalized elsewhere in the Tropics. 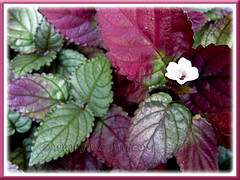 Plant type: An ornamental perennial herb. Features: Hemigraphis alternata is a species of the genus, Hemigraphis, which consists of about 30 species that are native to tropical Asia. It typically reaches a height of 0.5-1 ft (15-30 cm) and can spread indefinitely on the ground with its creeping growth habit, rooting at the stem nodes along the way. 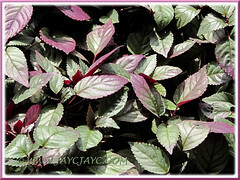 Hence, this fast-growing prostrate-creeper, an evergreen, tropical perennial, is widely grown as a ground cover and chiefly for its colourfully attractive foliage. Oval to cordate-shaped leaves (8cm long and 4 cm wide) with scalloped margins are produced, opposite, along its slender, purple stems. 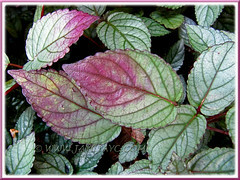 Leaves are rather wrinkled, bearing well-defined veins and come in marvelous variegated colour tones. Depending on the light received, the colours of the upper surfaces may vary from metallic or silver gray-green to bluish-green, and some may be flushed with light to deep purple or reddish-purple to maroon or simply, just tinged pink. 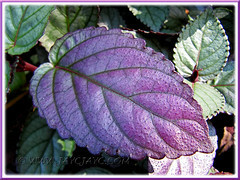 The underside of leaves may be purplish-red or wine-red. A popular cultivar, H. alternata cv. 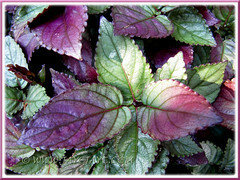 ‘Exotica’ (Purple Waffle Plant) has leaves that are very puckered or rippled, ovate to oblong in shape and mostly coloured dark metallic green on top surface and purple beneath. Red Ivy will bloom intermittently throughout the year in the tropics. The tiny (1-1.5cm diameter) five-lobed, bell-shaped, sterile flowers are white in colour with faint purple markings within and borne on 2-10cm long terminal spikes. Though small and insignificant, they do provide added interest and lovely colour contrast. Culture (Care): Hemigraphis alternata grows easily with minimum care. It enjoys the tropical climatic conditions. Light: Grows best in partial sun or semi-shade to shade. It tolerates full sun but prefers to be protected from the hot afternoon sun or hot summers. Leaf colours are vibrant with sufficient light or sunlight but under low-light conditions, leaves tend to be dull and mostly, just grey-green without the metallic sheen. Moisture: Medium water requirements. Best with regular watering during the hot seasons but reduced during the cooler climes. Soil: Prefers humus-enriched, moist and well-drained soils. Others: Cut back straggly stems to rejuvenate growth and encourage branching. Mist leaves frequently, especially in hot weather. Feed once fortnightly with a balanced fertilizer for foliage houseplants. Generally, free from serious insect or disease problems. However, watch out for scale and whiteflies. For subtropical and temperate regions: Hardiness: USDA Zone 10a-11. A frost-tender perennial that prefers a minimum temperature of 60°F (15.5°C). In frosty regions, grow it outdoor as an annual or alternatively, grow it in pots and overwinter indoors as a houseplant or greenhouse plant. Water normally during warmer seasons but sparingly in winter, likewise for feeding too. It is known to die back in frosty areas but come back during warmer climate in spring. 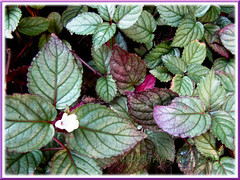 Usage: Hemigraphis alternata will make an excellent perennial ground cover in the tropics or as an annual in cooler regions. 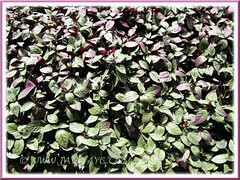 Great as an ornamental low-creeper for garden borders and beds with its eye-catching and colourful foliage. Also, it’s ideal to be grown in containers or raised planters, be it outdoors or indoors. A fabulous plant for hanging baskets too with its dense foliage on rather long trailing stems that cascades over beautifully. Furthermore, according to a study by University of Georgia in Athens, Hemigraphic alternata is one of the highest rated ornamentals with the ability to remove harmful volatile organic compound (VOC), to improve the quality of indoor air. I had many times failed to get this plant in my garden. They sometimes appear to be easy – the most difficult part to get them to grow. Once they establish – its just maintenance. The most critical part in propagation is the first few hours, once the plant looses its moisture and starts to wither – its surely a loss. Mine now doing so well that it now grows out of its soil medium – creating its own medium base and now extending its territory on my cement porch. The only thing is – I do not have those burnt metalic shades on my leaves. Thank you so much for sharing your gardening tips on this plant, James. Good reference when we do get our plant. You’ve hit the nail on the head when you mentioned about the critical part in propagation… we’ve experienced such failures when stem/tip cuttings go for a ride with us as we run our errands and plant them much later when they’re already slumped. Thank you, thank you, for your encouraging words about this incredible beauty. 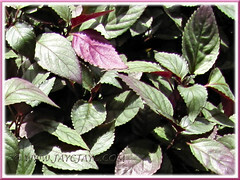 Purple has been a favorite color for my gardens, and the hemigraphis alternata is perfect. I especially appreciate Jacqueline’s note about the care needed in propagation. I often see things in the woods that I try to root, but these walks are usually followed by a car ride home. I will now bring a vessel of water with me. You’re most welcome, Elisa. We love sharing plants that attract us. All the best in acquiring this beauty.